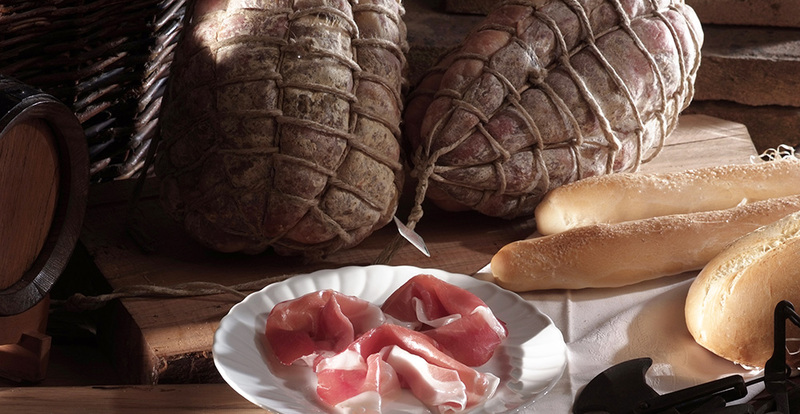 Culatello is another typical product of Parma and it has achieved the prestigious European label of Protected Designation of Origin (PDO) obtained under EC regulation n°1293/96. Obviously in order to be a PDO product, there are numerous guidelines to observe: in fact PDO Culatello has to be completely manually worked and to follow the guideline relating to manufacturing and maturing. Moreover, meats should derive only from kept pigs in the regions of Emilia Romagna and Lombardy. Only products, which are considered on a quality level suitable, can bring Brand of Consortium of Culatello di Zibello, a label that depicts a pig as the symbol of ancient roots that boasts this refined production. The Consortium of Culatello di Zibello comes into the world in 2009 in order to protect and promote quality and speciality of Culatello di Zibello PDO. The Consortium of Culatello di Zibello arranges 21 manufactures placed in villages of Zibello, Busseto, Polesine, Soragna, Roccabianca, Sissa, Colorno and San Secondo. In 2010 the Consortium got an important label from MIPAAF, the Ministry of Agricultural Food and Forestry Politics. The Institute Parma Quality is the Institution of the Ministry responsible for the guarantee of respect of the productive guideline and brand’s protection, defending the product from imitations. Moreover Culatello di Zibello PDO is included in the protections of Slow Food of Emilia Romagna. The project Presìdi of Slow Food came into the world in 1999 in order to protect and to recover little productions of culinary excellence threaten from industrial agriculture, from environmental degradation and from homologation. The certification of Slow Food is assigned to a scientific committee, and also it is not official, has criterion of definition similar to IGP and PDO certifications and a guideline still stronger. The term Presidio Slow Food is applied to uncommon and excellent products in danger of extinction, to groups of farmers, breeders, fishermen, who produce them and to guidelines and rules of production that distinguish them. In 2015 Culatello was also included in Decree Salumi, drawn up by Ministry of Agriculture and by Ministry of economical Development. With this change a legal protection on the production and the use of the denomination Culatello have been recognized. In the province of Parma the attachment to products of the tradition is so much strong because it created a large sequence of initiatives bound to the celebration of this salume. For example Festival of Culatello di Zibello is especially appreciated and it arrived to its 31 edition. The Festival is celebrated in June in the community of Zibello and it offers a rich menu, exclusively based on dishes which include Culatello. Other festivals and events, such as November Pork, are bound to Street of Culatello, project which is included in the activities of tourist appreciation and protection of regional traditions. How do you recognize a Culatello di Zibello PDO? First of all, you can learn to recognize different certifications which characterize it: the product must carry the seal CE, which certifies PDO based on regulation n°1263/96. Then you have to pinpoint the brand of Consortium of protection, the symbol of black pig. On the outside Culatello presents the form of a big egg, with a weight of around 3 kilogrammes. Its scent is intense and characteristic, with light shades of roses and moss. When you cut it, the slices have an uniform red colour with presence of white fat among the muscular bundles. Culatello is soft and delicate when it is tasted, it almost melts in your mouth.